Our Christmas and New Year did not go according to plan. It was all down to our cat Joseph being very poorly and we were unable to leave him, so New Year away was cancelled. I was going to take a Turkey Crown away with me but in-between Christmas and New Year the thought of it languishing in my freezer was making my mouth water as I love turkey and we didn’t have a bird on Christmas Day. I thawed it out to roast but of course I hadn’t planned on this so had no ‘extras’ in for stuffing etc. 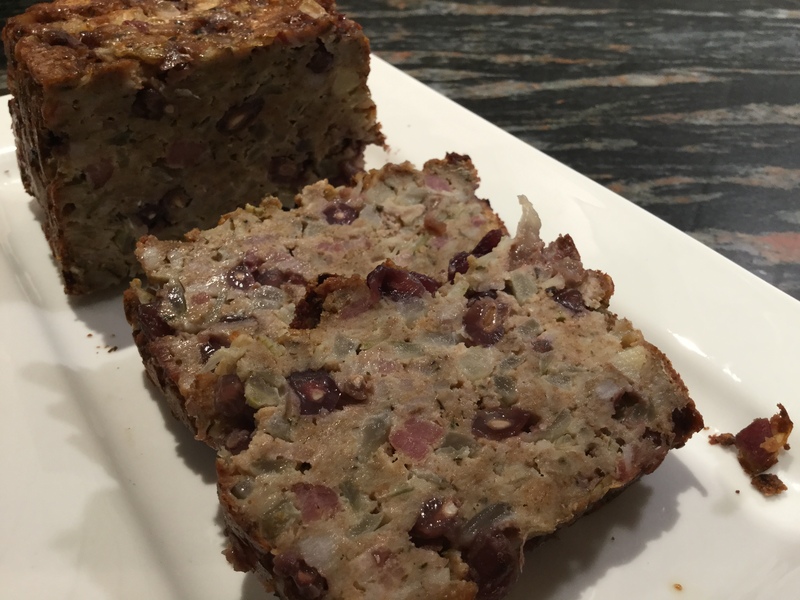 The few bits and pieces around the kitchen became my Christmas stuffing and as well as using up the left-over bits and bobs, they made a decidedly delicious stuffing, really, really tasty. Fry the bacon lardons until they release their fat and just start to turn colour. Place all other ingredients into a large bowl. Add the bacon together with its fat and mix well together. Pack into a greased loaf tin and bake at 350° for about 1 hour. Turn out and slice to serve with turkey or chicken. What a success ……. this was a really tasty, moist stuffing which complimented the roast turkey well. It tasted just as nice cold when I served it up with cold sliced turkey, my mango and avocado salsa and some carrot and courgette rosti. NB: All photographs used in this blog have been taken by me, and are of food I have prepared and served. 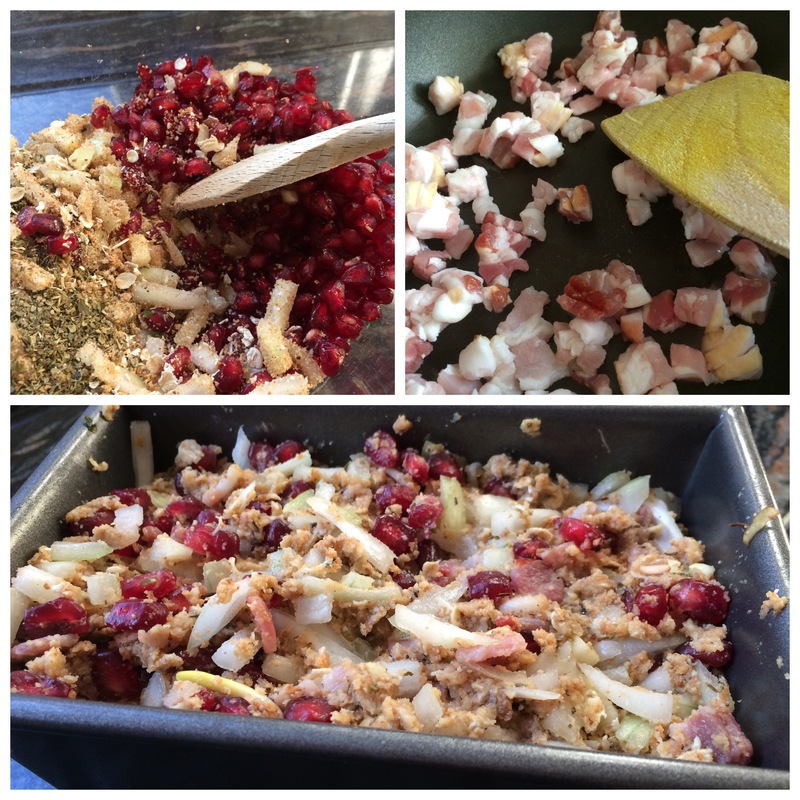 This entry was posted in Dinner, Miscellany, Vegetarian and tagged breadcrumbs, Christmas, Dinner, Egg, Garlic, Gluten Free, Healthy Eating, Mixed herbs, Oats, Onions, pomegranate, Stuffing, Vegetarian, Wheat-Free. Bookmark the permalink.